Elvis and Nixon is a very peculiar film; a premise without a plot or, indeed, a point. Like Snakes on a Plane, this is a movie in which the title spells out everything you need to know - here is a short, sparse feature based on the real-life meeting between the King and the President. Michael Shannon takes on the role of Memphis' most famous son - whilst the physical differences between the thespian and the musician are vast, the Boardwalk Empire actor imbibes his performance with a fittingly enigmatic charisma. Elvis, we learn, might be something of an old-fashioned conservative underneath all his bling and lounge lizard bravura. At the dawn of the seventies, the USA is a very different place to the country in which Presley originally made his name - the degenerate Beatles have changed the cultural landscape and the Black Panthers now roam the streets. Can the King make a difference and make America great again? His aim to become an undercover federal agent, to deliver his country from the abject direction it is heading, takes him straight to the top - can or will President Nixon grant his wish? 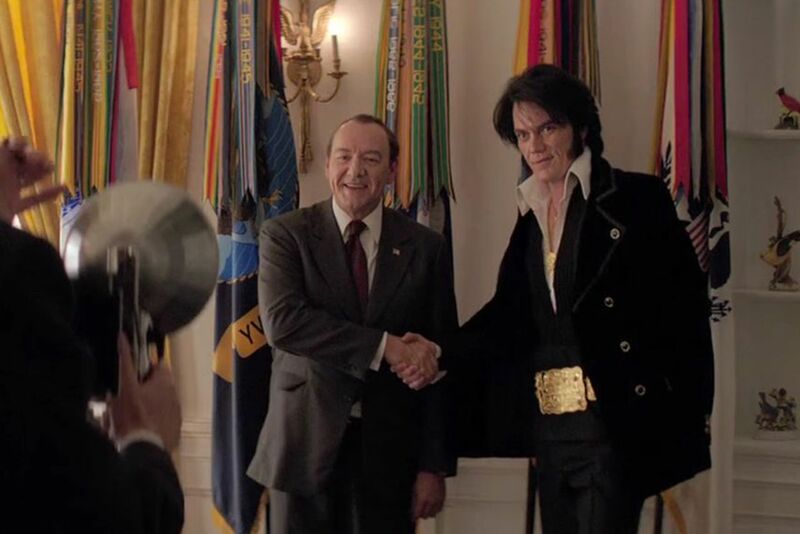 In essence Elvis and Nixon is a comedic character study but one which, sadly, strips away many of the most riveting aspects of the two American icons. Despite Shannon's performances, a lightweight script means we're never fully aware of Elvis' real intentions whilst, equally, Kevin Spacey's portrayal of one of the most complex and complicated public figures of all time is one of simple buffoonery. The darkness and self-loathing of the disgraced president are almost entirely dispensed with in favour of slapstick and gurning; the result often feels like a Jon Culshaw sketch stretched out for far, far too long. Whilst Elvis and Nixon does possess moments of genuine smirk-inducing humour, Liza Johnson's movie never really discovers its own raison d'etre - the meeting between the two, arranged by aides of the titular characters, is never seriously in doubt which relieves most of the drama from the set-up and, equally, very little of note is achieved in their meeting. Indeed, very little of note is achieved in this slight feature.